What a beautiful and intelligent cat! I love cats!!! Great photos! Cats are NOT easy to photograph! LOL! Funny cats....I love the intent look on her face! How funny, we had a manx that would come running every time the toilet was flushed. She liked to watch the water spin and go down. That was a seriously weird cat. We have had dogs but only one cat and she never did anything that. I hope your hands do not get too scratched! They sound so child like. Thanks for sharing a funny! Don't you just love the look on their faces, it is so reminicent of a kitten, even when they are older. Bootsie is facinated by the sound of the can of cat food being opened. That is pretty much his mingling with technology. The only thing more fun AND exasperating than an inquisitive child, is an inquisitive dog or cat! Lucy must be very intelligent to be so curious! Haha Rani does exactly the same thing!! 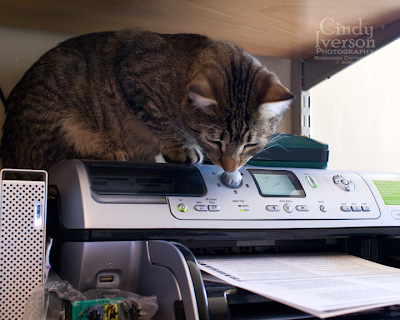 Although Rani is daft enough to sit in front of the printer so that when it spits out the printed paper, it hits her in the face which she thinks gives her an excuse to bite and claw the paper! Rani does the DVD thing. Oh they are funny aren't they?! It's good to see Lucy doing well. By the way, those photos in the last post are absolutely stunning!! I have something for you at Annalunda! LOL, your Lucy is a bit of a handful at times, isn't she? I think it's the sound that attracts her. Cats are very sensitive to sound, the higher the better. When I want my cats to come I call them in a very high voice and it works a treat. My lovely Wendy used to go crazy when I whistled and she would try to pull my hair in an effort to get into my head. She also came running when I was cutting paper. 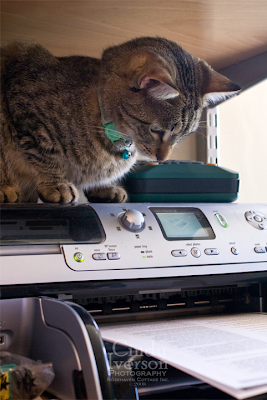 BTW on YouTube there are many vids of cats and printers, too funny. OMG, she is tooo cute!